Aero Shake is one of the many features introduced with Windows 7 and continues to be part of Windows 10 as well. The feature enables you to quickly minimize all open windows except the currently active window by shaking the currently active window or using Windows logo + Home keyboard shortcut. In earlier versions of Windows operating system, there was a dedicated option to enable or disable Aero Shake. Windows 10 Settings lacks a dedicated option to manage the Aero Shake. While I personally like the Aero Shake and use it very often, there are users who find it annoying as it hides all inactive windows upon (accidentally) shaking the active window. If you are also not happy with the Aero Shake behavior, you can disable it. Likewise, if the Aero Shake is not working or turned off on your Windows 10 PC, you can use this guide to enable it. 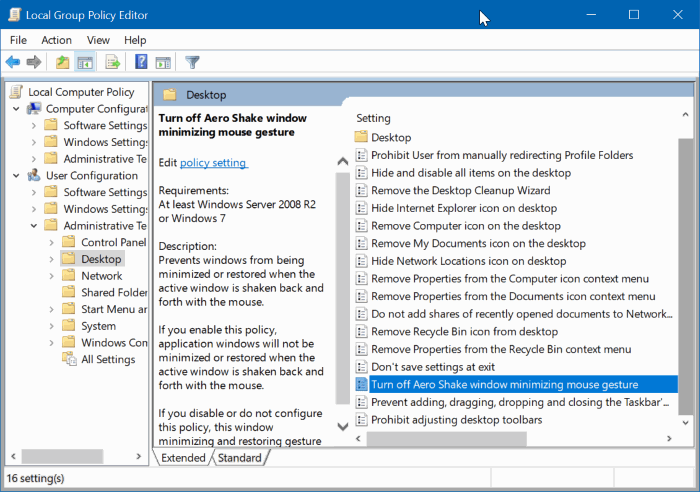 There are exactly three ways to enable or disable the Aero Shake feature in Windows 10. We discovered this feature by accident! The Aero Shake feature doesn’t work if the Snap is turned off. Step 1: Navigate to Settings app > System > Multitasking. Step 2: Turn off Arrange windows automatically by dragging them to sides of corners of the screen option to disable the Aero Shake. Turn this option on to enable Aero Shake. If you don’t want to turn off the snap feature or the multitasking features to get rid of Aero Shake, refer to the directions in Method 2 or Method 3. Group Policy Editor is not part of Home edition of Windows 10. So, if you are running Windows 10 Home, please either use the directions in Method 1 or Method 3. Step 1: Open the Group Policy Editor by typing Gpedit.msc in the Start/taskbar search box and then pressing Enter key. You can type Edit Group Policy in the search box to open the same as well. 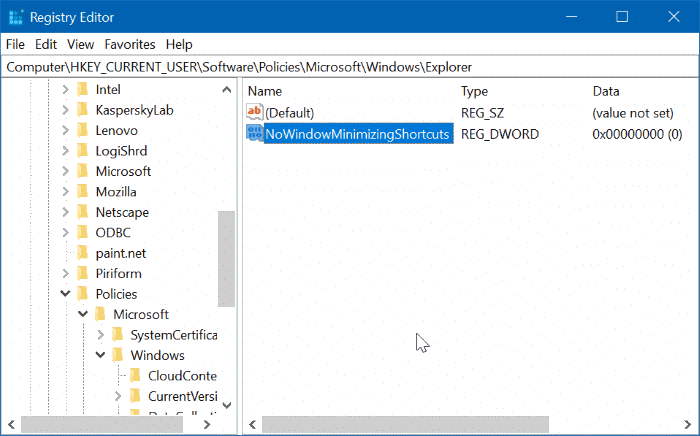 Step 2: In the Group Policy Editor window, navigate to User Configuration > Administrative Templates > Desktop. 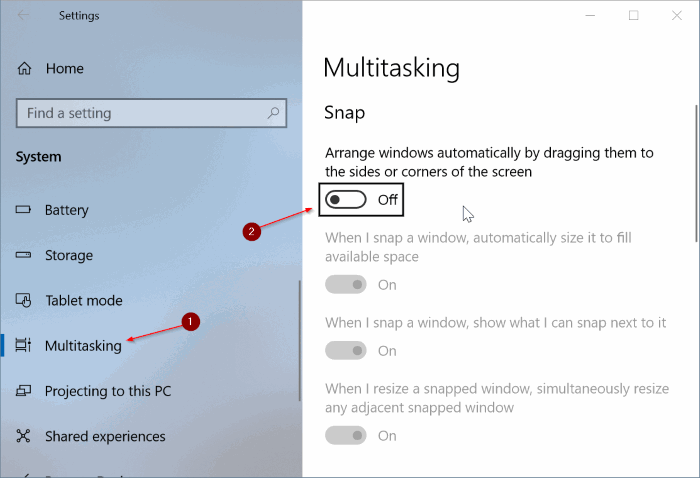 Step 3: Double-click on Turn off Aero Shake window minimizing mouse gesture policy. It will open the properties dialog. Step 4: Finally, select Enabled and then click Apply button. Step 1: Open Registry Editor. To do that, type Regedit in the Start/taskbar search field and then hit the Enter key. Click Yes button if you get the User Account Control prompt. Step 3: Double-click on NoWindowMinimizingShortcuts DWORD value and then change its value to 1 to disable Aero Shake and set the value to 0 to enable it. NOTE: If NoWindowMinimizingShortcuts DWORD value doesn’t exist, create one by right-clicking > New > DWORD value (32-bit). On some PCs, even the Explorer key might not be present. Step 5: Double-click on NoWindowMinimizingShortcuts and set the value to 0 to enable and change the value to 1 to disable Aero Shake.